The brightness temperature of the Sun constitutes a basic property of the solar atmosphere. The main emission mechanism of the Sun at millimeter and submillimeter wavelengths is thermal free–free emission from the chromosphere, which is an atmospheric layer with a temperature ranging between 6000 to 20,000 K. The opacity of thermal free–free emission depends on the temperature and density in the emission region. In addition, the Rayleigh– Jeans law is applicable to this wavelength range (Dulk, 1985); thus, we can develop vertical models of the chromospheric density and temperature distributions based on the brightness temperature spectrum of the thermal free–free emission. However, large millimeter and submillimeter telescopes are not always able to observe the Sun. 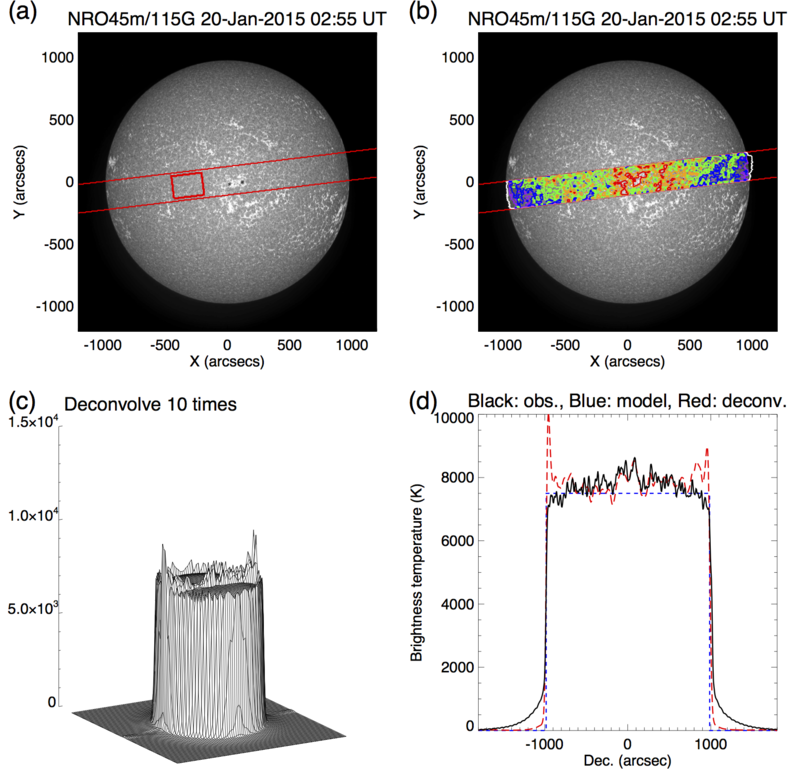 The purpose of this study is to establish observation and calibration sequences of the solar brightness temperatures at millimeter wavelengths using single-dish telescopes. We tuned the superconductor–insulator–superconductor (SIS) receiver by inducing different bias voltages and local oscillator power (called “detuning”), to reduce the sensitivity (i.e. increase the linearity) of the receiver system. We measured the beam efficiency of the 45 m telescope using the New Moon (so-called lunar filled beam efficiency), which can be used to calibrate the Sun, because the Moon has almost the same visible size as the Sun. The filled-beam efficiency of the 45 m telescope at 115 GHz is 0.74 ± 0.08. The beam pattern of the 45 m telescope was modeled as a summation of three Gaussian functions (main beam, narrow sidelobe, and broad sidelobe), as shown in Figure 1a. The Sun was regarded as a disk with a sharp edge (Figure 1b). We performed a convolution of the 45 m telescope beam with the modeled Sun (Figure 1c), which was expected to conform to the observed scan profile. Furthermore, iteration of the four free parameters of the two sidelobes (amplitudes and widths of Gaussian functions) to minimize the difference between the observed and convolved limb profiles was expected to provide the optimum sidelobe value. Figure 1d shows center slices of the modeled and observational solar disks. The real shape of the Sun is determined via deconvolution of the beam pattern from the observed map. Figure 1 (a) Modeled beam pattern of 45 m telescope at 115 GHz. (b) Solar-disk model with sharp edge at limb. (c) Solar-disk model convolved with 45 m telescope beam pattern. (d) Scan profiles of solar-disk center. Black, blue dashed, and red long-dashed: Observational result, solar-disk model, and solar-disk model convolved with 45 m telescope beam pattern, respectively. In this study, we defined the quiet region as the region that contains neither sunspots nor plages, using a UV image at 1700 Å obtained by the Atmospheric Imaging Assembly (AIA) onboard the Solar Dynamics Observatory (SDO). Figure 2 shows the region observed on 20 January 2015 by the raster scans conducted in this study. The red rectangle in Figure 2a indicates the quiet region considered here. We then produced a histogram of the brightness temperature of the quiet region, which was fit in accordance with a Gaussian function. The center of the Gaussian function was defined as the quiet-Sun level. The brightness temperature of the quiet Sun obtained in this study at 115 GHz is 7700 K.
Figure 2 (a) Full solar-disk image at 1700 Å observed on 20 January 2015. (b) Radio contour map observed at 115 GHz without sidelobe deconvolution overlaid on 1700 Å image. Red, orange, green, blue, and purple: 8300, 8000, 7700 (quiet region level), 7400, and 7100 K, respectively. (c) Solar disk after ten iterations of the sidelobe deconvolution. (d) Scan profiles of the center of the solar disk. Black, blue dashed, and red long-dashed: Observational result, solar-disk model, and observational result deconvolved with the 45 m telescope beam pattern, respectively. It is generally expected that the chromospheric emission at the solar limb should be brighter than at disk center because the emitting region is higher in the solar atmosphere; this is known as limb brightening. 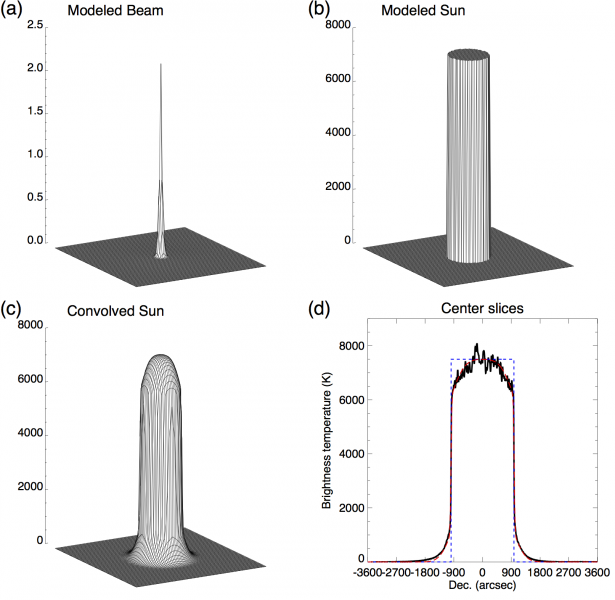 On the other hand, this study derived the telescope beam pattern from the observed solar disk by assuming a model that was composed of a flat disk with a sharp edge (see Figure 1b). Then, the real solar disk was derived via deconvolution of the derived beam pattern from the observed solar disk. Hence, the deconvolved disk should be flat, regardless of the occurrence of limb brightening. However, the deconvolved equatorial scans in Figures 2c and 2d exhibit a brighter limb. In our study, several network magnetic fields are apparent in the limb regions of Figure 2a. As the radio emission from these structures can cause brighter limbs, this may have led to pseudo limb brightening. In fact, Iwai and Shimojo (2015) have found that the brightness of the millimetric radio emission corresponds to the chromospheric structure. Note that the real limb brightening should exist at millimeter wavelengths. However, it cannot be deconvolved from the beam that derived from the flat disk model. In this study, we established solar observation and calibration techniques at 2.6 mm wavelength for the Nobeyama 45 m telescope and accurately derived the absolute solar brightness temperature. The well-calibrated single-dish observations are important for high-resolution chromospheric studies because they provide the absolute temperature scale that is lacking from interferometer observations. In ALMA Observing Cycle 4, which began in 2016, ALMA will carry out single-dish solar observations which can be used to derive the absolute brightness temperatures of the diffuse structures. The calibration techniques established in this study will be applied to their calibrations.